No more using the effect_ functions!!! ->How do I use particles? And how can I design them? This program allows you to create a particle system with all of the functions available in GM6+, but it also allows you to create emitters, attractors, changers, deflectors, and destroyers. With its easy interface and random generating particles, you will be able to create particle effects and particle systems much much quicker than you can by reading the code! You can export the entire system to GML to use in your game, or take screenshots and animated GIFs. 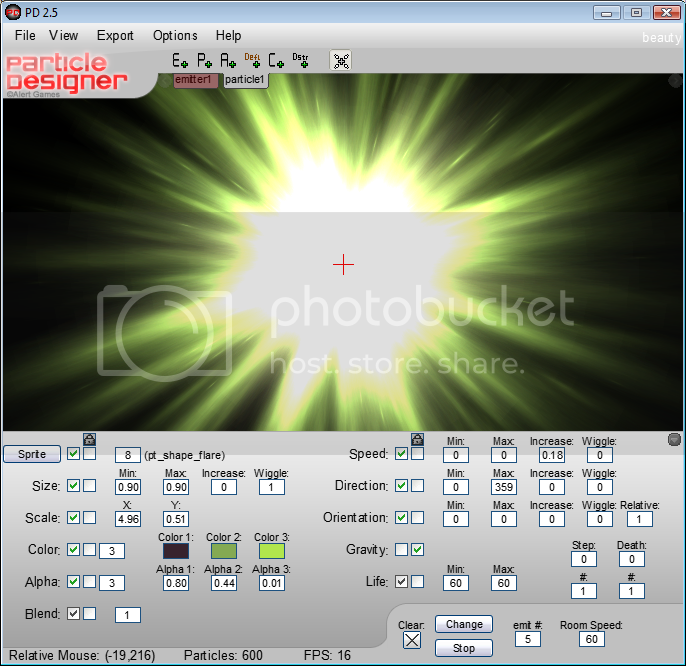 This program doesn't need to be used just for game maker, you can create nice looking effects for anything! Why should I download version 2.5? -->Fixed a display glitch switching to tabs in advanced mode. -->Fixed characters not being displayed for some different languages. -->Fixed other menu and loading bugs. *OFFICIAL PD2 PAGE* - INCLUDES: updates list, FAQ, extra particles, etc. (~3 MB) Windows 7 Compatible! If you translate the file, and would like me to host that language and feature it here, please send me a PM (Personal Message). If you would like to DONATE to the project, please click here! Credit: Credit is not required for anything generated, but you may put credit as "Alert Games" if you want to. -Not able to have FPS over 60? -Buttons for shifting color of the particle, proportional scale and size, etc. When I export the particle and put it in my game, it gives me an error! Be sure that you have everything necessary for the particle to work. The particle system creation code is not exported on default. You can change this in the preferences, or just add "Sname = part_system_create();" before the particle is made. The reason for this is so unnecessary extra particle systems are created. Be sure to remove the system when you need to. be sure to check that the particles and particle system is only created once. They only need to be called in the create event, and they can be used with multiple objects. Once you are done with the particle, you can delete the system if you need to. To stream the particles with an emitter, it only needs to be called once. But you can change the region in other events. If there are any bugs, suggestions, comments, post them here! Edited by Alert Games, 18 October 2014 - 12:08 AM. !JOIN the collaborative Game Maker google+ Community!! edit: the screenshots work now. The program is awesome. Really great for game development. THe bug i found was when you click to type in your number the 0 dont go away and if you type in numbers after it it will just go back to 0. THanks for making this. It will save me a lot of time. Edited by fire_soul453, 13 April 2007 - 01:21 AM. Edited by Alert Games, 13 April 2007 - 01:10 AM. Is there any way I could get the source for your codebox? Well, I can make an example, but right now I am busy. Also, the codebox does still have some minor bugs in it having to do with the horizontal viewing. I would tell you to try to make one on your own, but it is actually quite difficult. But, if I make an example, I'll PM you here. It's a good program, but even bigger improvements, especially a glossy / photoshopped GUI would make it nice. I'm making PythonPartix for now... with a nice GUI... about like your particle designer. Edited by Schreib, 13 April 2007 - 09:28 PM. I've been using Particle Designer 1.2 for a while now (I've been using it in my current project, too), and I really liked it. The new one is great! I haven't tried using many of the new features, but this is a great improvement over the last one. The only problem I found is that exporting to the clipboard doesn't seem to work (or maybe I'm just doing something wrong). Other than that, it's very good, and I recommend it to anyone who has Game Maker. Even if you're not registered, it still comes in handy because you can export effects to animated GIFs and use them as sprites. I'll give it 9/10. If it weren't for that problem with the clipboard, I'd give it 10/10. Great to see it finally released. I always loved this program and used it a lot, as it allows some particle designing "on flight". The new version seems to be even better and I'm sure I'm going to use it for my next project. I have to agree that it's a great program, but there are details to take care of. There is a bug when deleting the third particle type. If you set it to emit from the emitter, and then delete the particle tab, it still emits that particle type when pressing burst. There is some clipboard issue as well. The GUI is really the thing that needs fixing. Do you have photoshop? With a flashy GUI I'd give this 95%. Edited by Schreib, 14 April 2007 - 02:06 PM. This reminds me of exgen. Almost as good, actually in my opinion its better. 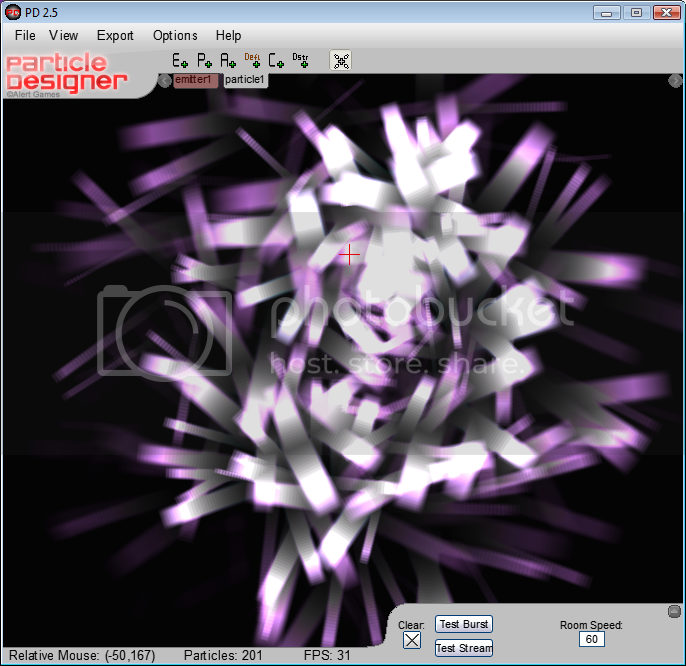 Is quick, easy, free and exports the particles as scripts!. It is pretty nice! It gives me inspiration to work on some of my projects . Also, I do have photoshop, but I didn't work on the GUI really. There shouldn't be any problems with the clipboard. What specifically didn't work? Ah, about time you got this finished. Great program. Great program indeed. Been using v1.2 to test out particle effects, so I wouldn't have to start my game every time to check them out. I have sad news. Apparently a dll that I use in the program interferes with the program, specifically when it has a parameter when running. Therefore, I am having some difficulty compiling it for Vista users. Sorry. I'll try to find the problem for the eventual release of PD2.1. Thanks for your feedback everybody. This sounds great, although I am running vista. I'll download it as soon as it will work. Yeah, sorry about that. I will try to see what the problem is, but it may take a while since it is not my main priority. 3) You ran it by using "open with..."
The reason why it gets that unexpected error is because it has a problem with a dll and a parameter at the same time. I want to fix it, but it may take a bit to figure out. The problem with the clipboard is that none of the "export to clipboard" options put anything on the clipboard. I'm using Windows XP, and it worked fine in version 1.2.
hmmm... i have tested it. What tab did you try to export? My first impressions are very good. Wow, I've used this extensively now and I find this AMAZING! I love the random - this is quite entertaining. The ability to move emitters, change the room speed and do everything else with the particles is just brilliant! Having it all extract to GML was a great stroke of awesomeness. I love this program! 10/10! I've tried exporting the particle system and the emitter, but neither of them put anything on the clipboard. Is there anything I forgot to do? No, I just noticed the bug myself. There was an error in the emitter export script, so I will fix that for 2.1. Obviously my beta testers weren't that good >_> Sorry about that. I guess PD2.1 will become a greater priority. Also, the menu dll is causing a lot of problems. You can only run the program directly pretty much, and it won't work in a GM7 executable at all. I will probably get a new dll, or use some sort of menu example to fix this. The skin could use some work as well. Edited by Alert Games, 29 April 2007 - 02:57 AM. That was tight. What else is there to say? Looks cool, too bad it's not a GM7 exe. Tha main problem is that if I make it a GM7 exe, then the menus will not work. I need a good menu system GM7 compatable before the release of version 2.1. So far, I fixed a bug, and i'm working on fixing another bug. Im also working on the appearance, and eventually a little of the codebox and an efficient save method. What is the code that makes it incompatible? New website / blog! · Facebook · Twitter · More to come! Hover Tank 3D · Evolites · Linked · Aces High · Sun Sun Der · Falcon Squad · More! Actually, I don't know. I just tested it and it worked fine. The real problem is, whenever a parameter string is used, GM (6 or 7) does not open a file for reading, and causes it to not load your current settings. This can be a problem, cause if you don't click on the EXE itself, a parametric string maybe used and set off the settings. Do you have any idea how to solve this? Edited by Alert Games, 03 May 2007 - 09:29 PM. Apparently, GM has a problem reading files when there is a parameter string, so I am going to fix that too Along with the others mentioned above. Is it writen in Gamemaker? You could also add friction for shapes and the friction has minimum and maximum value. It will be useful for explosions. Edited by Keth, 04 May 2007 - 10:55 PM. Great program, I will use this often (i already used PD1 quite regularly)! @Erik Leppen: Well, the reason why I do that is because that is how it is set up in the function. All the buttons go in order of the manual. Enjoy! And leave and comments and/or concerns! Great. I'm downloading the updated version right now. I'm reworking some of the effects in MAGI and I'm going to use PD extensively. Once again - thanks for this wonderful tool. EDIT: One thing that would be really great - exported particle name should be the same as the file's one, not "particle#". This would save some hassle of renaming the particles manually, once they're saved. An option in preferences would suffice. This is actually the only thing I find annoying when working with PD. Edited by TeeGee, 21 May 2007 - 08:14 AM. Actually they are. At least they are when you export to file. It would save me those extra few clicks needed to rename the particle. If it should name the particle automatically, then I have now idea why it doesn't . Edited by TeeGee, 21 May 2007 - 08:29 PM. EDIT: OH, I know what you did. You should name the tab the name you want the particle to be, and the file can be any name you want That way, you can call the particle name the same, but have different filenames. Cheers! Edited by Alert Games, 22 May 2007 - 08:56 PM.